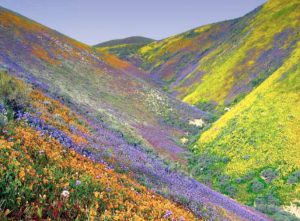 “CALIFORNIA GEOLOGY EXPLORATIONS” is designed for students in grades 9-12. This program focuses on the geology of California with a special emphasis on the tectonics and paleontology of California’s Southern San Joaquin Valley and the surrounding mountain ranges. “I Was Just Petrified” – Compares the composition of several fossil sites. “Shake, Rattle and Roll” – Investigates California’s San Andreas Fault..
“Black Gold – The Oil Experience” – Studies California’s fossil fuel resources. “Water Fight!” – Investigates California’s water battles. “Can I Please Get a Straw? – Takes a look at the distribution of water in California. “Ecology of Farming” – Explores the importance of farming. “I Need a Drink!” – Examines the adaptations of plants and animals to the desert. “Wild About Elk” – Takes a look at the California’ wild elk and their history and ecology.